I have often written about how I pack and how I create little capsule wardrobes to create a great variety of outfits for a holiday. But how do you pack for a trip of 3 months that has a multitude of activities across 2 continents in various climates? Ideally you want to pack little capsules for each of the actitivities that you are planning on doing. As you can see, the list is so varied and needs such diverse clothing that I could really only pack one outfit for each activity. For a girl that needs variety and options that is just not a good idea. Packing light is definitely not an option here! However, it’s good to have each of these activities in mind and make sure that you have the minimum necessary to carry them out. Then I rounded up all my favorite clothes of the moment. As I’m firmly in neutrals country at the moment, most of these items mix and match well together. Primarily the collection consists of whites, blues and greys with splashes of reds. Rather than planning out each outfit I just fit as many of my favorite clothes in the suitcase. Then there are the accessories. These are more important when you start to wear more neutrals as they add the color and variety and make the outfit more special or truly unique to you. So I made sure to bring a variety of accessories which will still give me plenty of options to play with my outfits and have fun with it even when travelling. We are all different when it comes to packing for holidays but I have learned that for me it does not make too much sense to pack too light if there is no real need for it. I once went on backpacking holiday (where it definitely made a lot of sense to pack very light) and I decided that I did not need any frills like lipstick. I can still remember it so well as it almost ruined the holiday. I missed that lipstick every day and felt totally awful in my drab practical clothes. Of course packing light can be important (you don’t want to strain your back!) but you also have to be careful that it does not go at the expense of making you feel drab or uninspired. I learned my lesson on that trip and know that it’s always important to bring some things that make me feel beautiful and special on every trip. So no, this is not a light suitcase (travelling light is not one of my fortes anyway) as the variety of clothing is more important for this trip than the convenience of light luggage. It is important to note though that I will hardly ever have to carry my luggage since I will be doing most of my travels by car or stay stationary in one place for a large amount of time. I will also make use of several sizes of suitcases for various trips or split my stuff across 2 suitcases so I only need to use one lighter one. I concede that I probably did pack a bit too much because I usually shop quite a lot this time of year. It’s the sales for my dominant season as I need hot summer clothes year round and I usually end up buying quite a bit. But I also wanted to make sure that I did not HAVE TO buy anything. This will avoid buying mistakes as I can just concentrate on new things that will really add value to my wardrobe rather than buying things that would replace items that I could not pack. Everything is already in my suitcase so no pictures of the actual items I took this time, but I will be sure to share regular updates of my looks on this site and through Instagram. Here are a few pieces from my travel wardrobe. 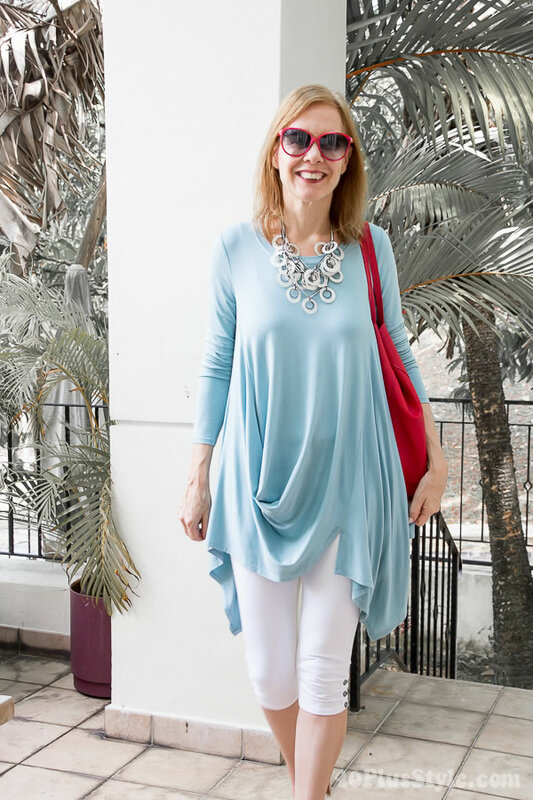 The mint green tunic is perfect to wear with both capris, leggings and full-length pants. It looks unique both from the front and back and the extensive draping is perfect to pair with simple knee-high leggings such as these. Even though I wore heels here (which did not make the cut for the travel wardrobe), this combination would look equally good with my flat white slingbacks (which did made the cut for the travel wardrobe). Adding a third color with the red accessories makes this look more interesting and hip.